The US State Department discourages traveling to certain parts of China because the pollution is so bad there. What do we have to say about that? Eat your heart out, China, cause you’ve got nothing on the Salt Lake Valley. Inversions are a common occurrence every year, but every year they just seem to keep getting worse and worse and worse. Below is a picture that I took from the window right next to me. Normally, you’d be looking at a beautiful view of the city and overlooking the entire Salt Lake valley. On a good day, you can even see as far as Mount Nebo (about 65 miles south). Today, however, you can see no more than a half a mile (if your lucky), as the picture clearly shows. No city skyline, no Mt. Nebo. Just smog, exhaust, and more smog. Also, keep in mind that this picture is taken about 12:00pm on an otherwise sunny and cloudless day! Just how bad is our air quality? 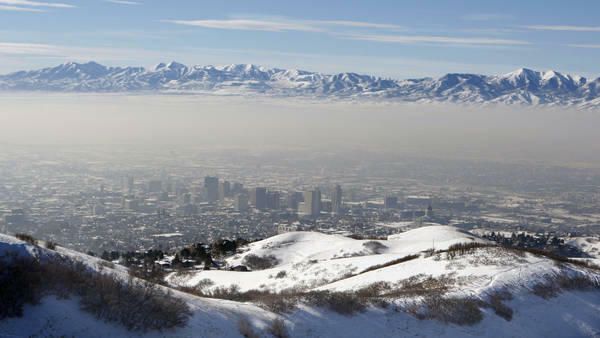 AirNow.com, a website run by several government agencies, rates four cities in Utah as having the worst air quality in the nation. Included on the list is Salt Lake City (of course), Logan, Ogden, and Washakie Reservation in Box Elder County. For 99% of the year, Utah is an awesome place to live. Unfortunately, this year’s 1% seems to be lasting a lifetime. Bags on January 8, 2011 at 9:13 pm. I hate the inversion so much! StephAnn Knotts on January 9, 2011 at 5:54 am. Amen. This was my first day in the SL Valley ALL day since it started. I feel like I’m gonna suffocate and die. George on January 5, 2013 at 7:06 pm. I love inversions, they leave me feeling so fresh and healthy.